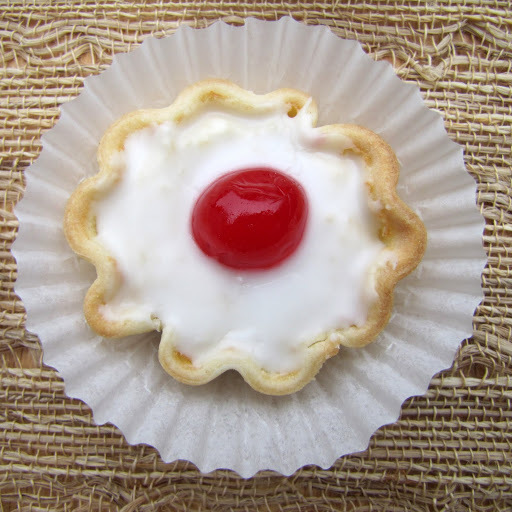 I’ve never seen a Bakewell tart for sale in the United States, although I’m sure some bakery somewhere does indeed sell them. 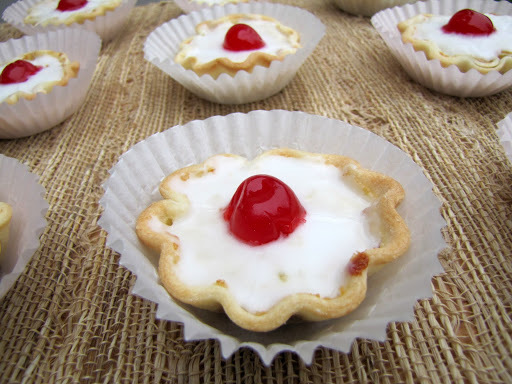 I remember this popular English dessert from my trip to England when I was a teenager. We had them with our tea. 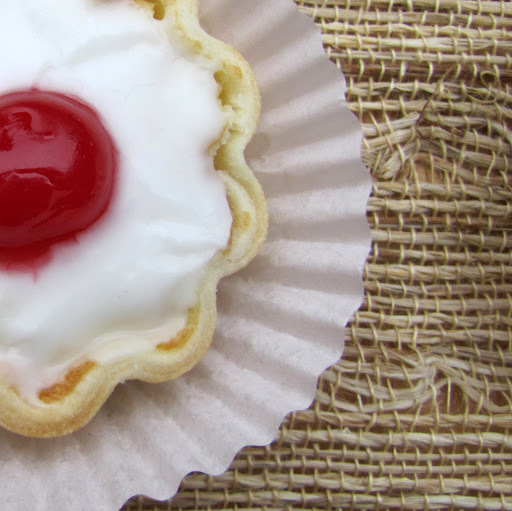 A Bakewell tart is a pastry, filled with jam and almond sponge filling, topped with icing and a cherry. My mom is hosting a tea party this afternoon, and she asked me to give these a go. They turned out perfectly, and so pretty too. In the bowl of a food processor, combine the flour, confectioners’ sugar and salt and pulse to mix. Add the butter and process in short pulses until pea-size crumbs form, 20 to 25 seconds. While pulsing, add the egg yolk mixture and process to form large, moist crumbs, 10 to 15 seconds more. Turn the dough out onto a lightly floured surface, shape the dough into a ball and divide it in half. Shape each half into a flat, 5-inch disk, cover with plastic wrap and refrigerate at least 1 hour. Position a rack in the center of an oven and preheat to 400°F/200°C. Working with one piece of dough at a time, roll out to 1/8-inch thickness. Using a 3-inch round cookie cutter, cut out 12 rounds of pastry. 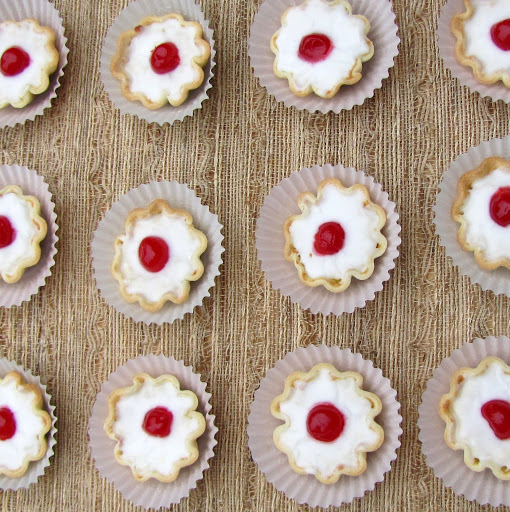 Transfer a round to each well of a 12-well mini tart plaque or mini muffin pan (or you may use individual mini fluted tart tins). Using your fingers, press the pastry to fit into the well. Refrigerate until ready to bake. In the bowl of an electric mixer, beat the butter until light and creamy. Add the almond paste and granulated sugar and beat until smooth and creamy. While beating, add the eggs a little at a time, blending well after each addition. Reduce the speed to low and fold in the cake flour until just blended and no lumps of flour remain. Spoon about 1 heaping tsp. jam into each tart shell, making a thin layer about 1/4 inch deep. Spoon the filling into each shell, filling it just to the top. Bake in preheated 400°F/200°C oven until the tartlets are golden, 12 to 15 minutes. Set the pan on a wire rack, cool the tartlets to room temperature. Repeat with remaining dough to make 12 more tartlets. Sift the confectioners’ sugar into a bowl, then combine with about 2 tablespoons of water and stir until smooth. 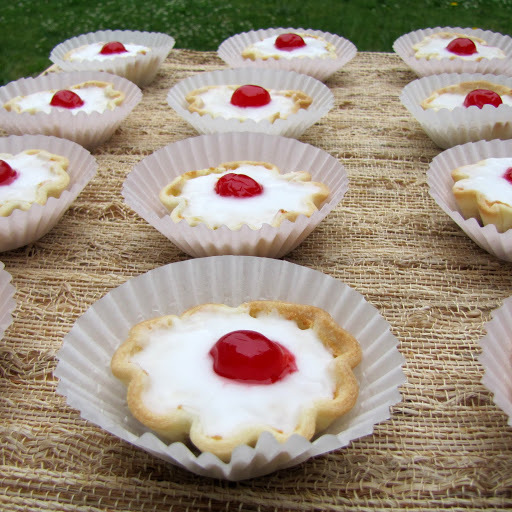 Spoon the icing over the cooled tarts and top with a glacè cherry half.